Prime Power – where generators are the only source or main source of power as in island-mode, marine, remote site or military type applications. Standby – where the generators serve as back-up to the main (utility) source, commonly installed in hospitals, airport, data centers, waste-water/water treatment facilities, including most life-safety institutional applications. Distributed Generation Systems – where generators are applied to supplement the main source (as in peak shave applications) and may also act as the standby system as well. Load priority control where loads are applied from a pre-determined sequence, highest to lowest priority, based on system capacity and characteristics. Generator operational control where only the pre-determined number of generators are asked to start and carry load, either in a scramble or preset start-sequence. 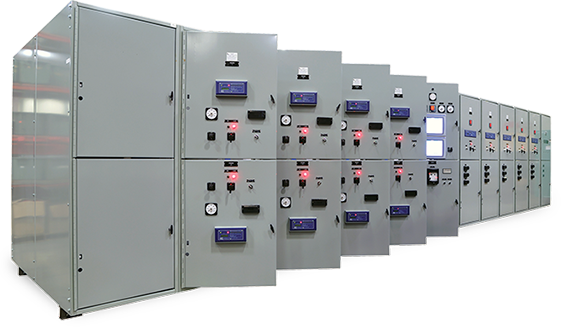 Operator interface touch-screen terminals (OIT)/Human Machine Interface (HMI) where system controls and interrogation can be accomplished at the switchgear or from a remote network/PC/PLC. Remote communications in the most common industry protocols like modbus/canbus and being fully conversant with industry leading Ethernet/interface modules, comm-ports and RS 485 type connections. Utility paralleling system designs in passive closed transition (waiting for the sources to become synchronized in voltage, frequency and phase angle), active closed transition (where synchronization is dynamically controlled), soft load or continuous base loading systems.